We use many websites daily but sometimes create account in a new website and then forget. Having an inactive account does not hurt but receiving notification emails from those services sometimes irritate. We can easily unsubscribe emails from that service but it is hard to find the way to completely delete the account from a website. 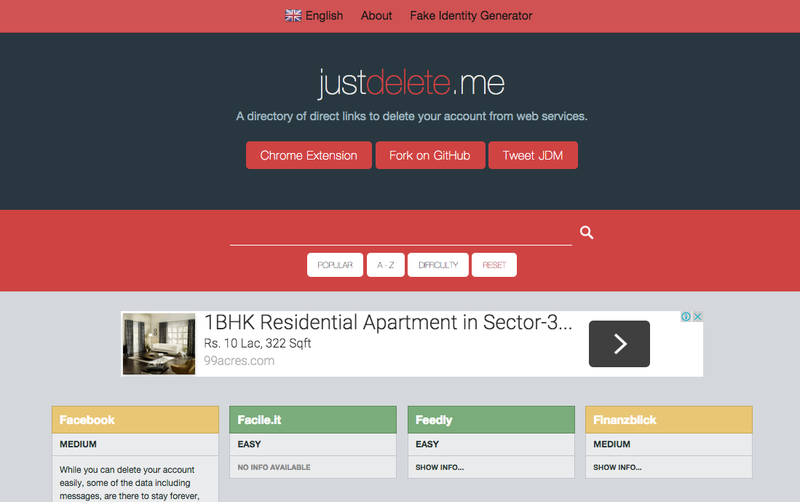 So, there is a website “Just Delete Me” which wants to help you in deleting your account from various website. If you are not sure how to delete your account in a specific website, you can use Just Delete Me to know where is the option to delete the account. You have a search box where you want to search the name of the website and then see the link and information. You will see the results below. You can click on cards results to directly visit the link to delete the account in that website. Websites are also marked as easy, medium, hard or impossible depending on how difficult it is to delete that account in that website. If you want to delete the account in any website, try this website.